Nobody seemed to question the why of this response. The answer would involve realising that all those ancient cultures were right about something the Abrahamic religions got wrong. The Sun that makes life possible for life on Earth knows life itself. It’s not a random ball of gas that just happens to facilitate life, but the star of the creation process that enables life on Earth – and everything else in this family of planets. Respect. So what do we witness in a total eclipse? We see the corona – a normally invisible energy field that occupies more space than Sun itself. Solar scientists believe it creates and controls sunspots, solar flares, coronal mass ejections and prominences – while calling it Sun’s greatest mystery. Our own minds are an invisible energy field that is seen as the greatest mystery of human existence. Minds control some of what our bodies do, but not a lot. Whether they knew it or not, those scientists, regular people and media reporters were all getting a spiritual buzz from witnessing the mind of our local star, a character our distant ancestors saw as divine and deserving of gratitude. Across America this gratitude unconsciously came out in the whooping and shouting and ecstatic awe of those who had congregated for the shared experience. Perhaps some enlightenment was gained in the process. Intrigued by this idea and want to see where it leads? 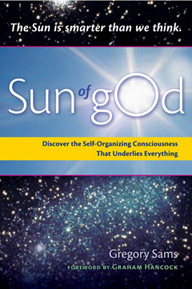 Check out my book, Sun of gOd, with a Foreword by Graham Hancock. It’s the only one out there.